Today I was doing research on EKT Exam procedure and details, I visited many sites but Ifound little or less info everywhere, so I decided to write a complete overview of EKT exam with its purpose, eligibility, process, syllabus and preparation tips and methodology of exam. EKT stands for Engineering Knowledge Test, it is conducted after AFCAT (2014 onwards). Test is of 30/45 minute and are given by those who opt for technical branches i.e. Flying ,technical and GDOC. This exam was conducted earlier and was of one hour it has now been opted again and will be of half hour. 1. Many experts feel that the introduction of Engineering Knowledge Test has come at right time as IAF needs to compete with other leading countries with the day to day modernization. 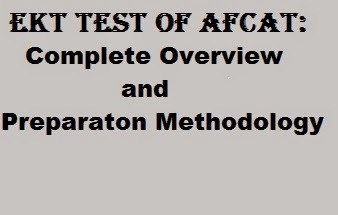 EKT of AFCAT exam will prove as a boon for IAF's future. 2. They not only making your officer but giving you the opportunity to do something in technical field. EKT can only be the point of testing your Engineering skills. Candidate, who have qualified for AFCAT exam and applying for technical branches are eligible for EKT Exam. No other special Eligibility is needed to be eligible for exam. Process is not so clear as it was mentioned earlier that question paper will be of 30 minutes but according to last exam. 5. Subject: Electrical and electronics, mechanical and Computer Science and Engineering. · Firstly I want to say that you are engineering students like me, you have the capabilities of reading the whole book in night. God has gifted you capabilities of doing miracles. Any finally most of you feels that you are weak at technical side. · No need to worry for that just relax pick a book that can give you over view of your branch and if you have done engineering with efforts then no one can stop you to qualify EKT exam. Pick your subject books and have a overview. There is no particular syllabus decided officially so you can study basics things first. I have tried to put a syllabus for EKT and that you can find above. · For those who are weaker at technical side just pick any of books available in market, like Arihant publication is providing a separate book for practice, and also if you are having any GATE Preparation material or book then it is also sufficient. · One of my friend told me that, he had a book of GATE preparation-GK publication you may have heard about that. If you have it, it is best. · And for those engineers who have less knowledge and their luck is high, I will say go in your way no one can stop you again.